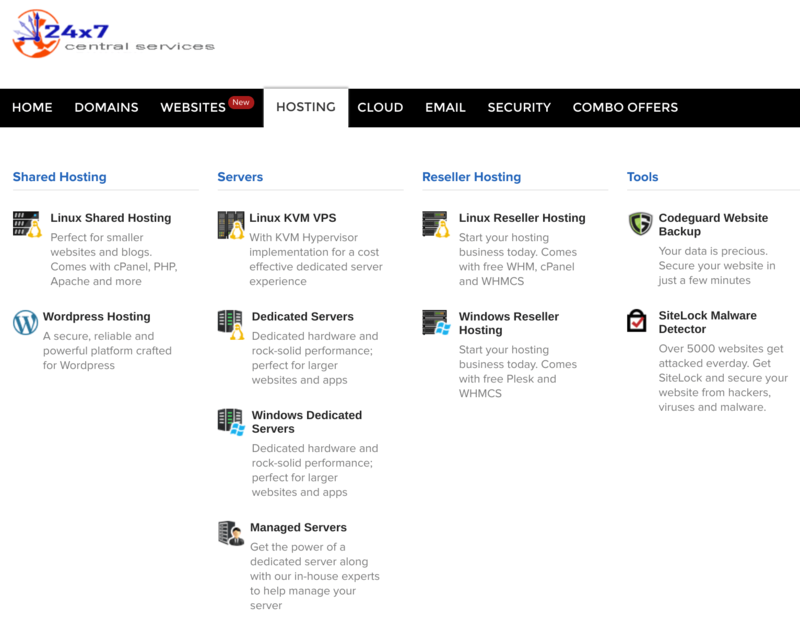 24×7 Central Services Review 2019: Is 24×7 Central Services a Good Hosting? 24x7 Central Services is an Indian provider with a comprehensive selection of hosting plans. It has a network of servers in data centers located around the world. 24×7 Central Services is an Indian website hosting company. Their LinkedIn page states they were founded in 1987, which (if true) means they have an exceptionally long track record in the information technology industry. Their website and support are available in English. 24×7 Central Services has a network of servers located in multiple data centers worldwide which are monitored and guarded 24/7 (hence the name). This global network allows them to provide a 99.9% uptime guarantee, redundancy and scalability of resources. They use top quality hardware including dual Intel Xeon Processors and solid state drives (SSDs) for reliability and speed. The four WordPress plans are Starter, Performance Lite, Business Lite, and Professional Lite. These plans start at one WordPress installation (2 GB RAM, 5 GB storage) and increase to five WordPress installations (6 GB RAM and 40 GB storage), all with unlimited email accounts. The Linux plans are called Business Hosting, Professional Hosting, Star, and 2 Star, which – excluding the cheapest Business Hosting plan – all come with unlimited disk space and data transfer. The plans come with the easy-to-use and reliable cPanel control panel plus the Softaculous one-click installer (for 50 programs). Experts will love the support for many advanced coding languages and tools including Perl, Python, GD, cURL, CGI, and Ruby On Rails, as well as support for PHP versions 5.2.x to 7.1.x. At extra cost, they integrate with website building tools including Weebly and a separate website builder with more than 175 readymade themes. 24×7 Central Services also provides a white label service for customers who which to resell their services. The base Linux package is very affordable. It comes with 1 GB disk space, 25 GB data transfer, and enough resources for most everyday users. For customers who require more websites or high resource quotas, the next three packages are also pretty well priced. You have to pay extra for domain registration and SSL certificates. This company only offers one-year terms, which is a little strict, but they do offer a 30-day money-back guarantee to make you more comfortable with the commitment. While prices are displayed in GBP, AUD, CNY, INR, TRY, CAD, EUR, RUB, and USD, these are converted into INR for payment. To get 24/7 support, you can contact them by email, live chat (not working when I tried) or phone. They also provide a substantial knowledge base that helped me answer many questions without having to wait for an email response. 24×7 Central Services has a global network of servers. They provide 24/7 support and an uptime of 99.9%. Check out 24×7 Central Services’s web hosting options today! Wondering how 24x7 Central Services stacks up against other Web Hosting companies? Enter any other Web Hosting company and we will give you a side-by-side comparison.